It is Bethany’s and my desire to save marriages … lots of them. We can’t believe how many people think—when it comes to money—it is okay to fight, argue, lie and cheat. Or, that for some reason, money is a “hands off” subject in a relationship. We know that there is a money component in just about every discussion we have. So how in the world can couples say “we keep our money separate” or “a little lie here or there around money won’t hurt anything.” Are they crazy? It can KILL their relationship. Financial Infidelity continues to be a topic that is gaining space in our Media these days. You hear how it plays out both in the lives of the rich and famous, and in homes like yours and ours. Financial Infidelity is the act of lying, cheating, or hiding money behind your spouses back. It has the same effect, for many relationships, as sexual infidelity. It erodes trust—the foundation of any relationship. Imagine a glass jar. 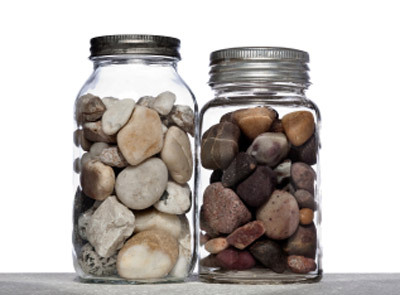 Every time you commit financial infidelity (no matter how intentional or how innocent, no matter how much or how little money is involved) it is like adding a handful of rocks to the jar. Every handful crowds out the good stuff that makes a marriage work. Slowly but surely you lose the passion and love in your relationship. You end up with an emotional jar full of rocks! The good news is that you can overcome financial infidelity. You can stop it right now, then move forward by forgiving each other and then build new patterns in your Money Relationship. It is time for you to take back your relationship and start to empty those rocks! Some years ago when my wife and I were first married, we tried to balance out the feeling of independence we were both used to as singles, with the enhanced responsibility to keep each other informed as we learned how to function as a newly married couple. One of the struggles we had, and we have known many other couples who experienced this issue, was what amount of spending constituted a spending choice that was OK to make on our own, versus major enough to warrant a discussion together. We started by designating a dollar amount that we both agreed was OK for either of us to spend without consulting the other. If a purchase was over that number, it required at least a telephone conversation before we moved forward. Thankfully, as our relationship has grown, and our finances have developed, the actual number itself has become less important. But the key to the strategy, coming to agreement together before proceeding with major spending decisions, still continues to serve us well.